Plastic surgery is a life-changing decision that takes a lot of contemplation and consideration. Browsing plastic surgery before and after photos to decide on the look you want for your breast augmentation is a good start, and searching “plastic surgeons near me in Pleasanton, CA,” can help you find doctors nearby. But for such a life-changing decision, don’t you want a plastic surgeon that can also give you an exceptional experience? In the Tri-Valley area, women choose board-certified plastic surgeon Dr. Eric Bachelor for his caring, compassionate manner and unmatched technical expertise. At East Bay Aesthetic Surgery, Dr. Bachelor will strive to help you achieve the look you want to fit your lifestyle. Dr. 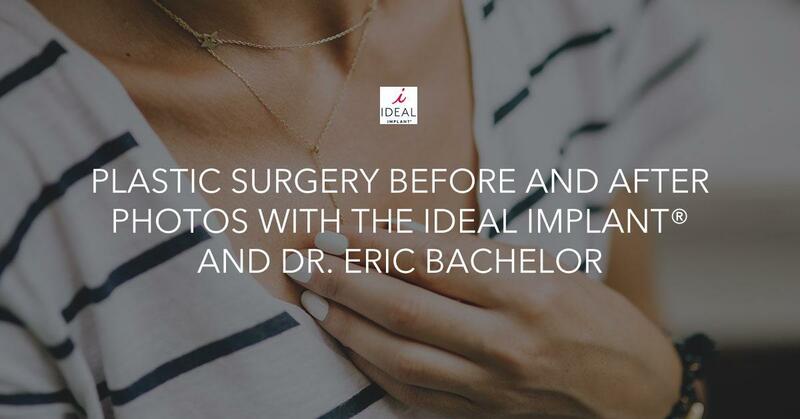 Bachelor is recognized as an Ideal Implant Premier Network Surgeon for his extensive experience working with IDEAL IMPLANT® Structured Breast Implants. More and more women are choosing this implant for its impressive safety features and unique design. In these photos you’ll see a 47-year-old woman who underwent a breast augmentation with the IDEAL IMPLANT. She chose IDEAL IMPLANTs filled to 350cc for this procedure for dramatic and beautiful results. When you pick the IDEAL IMPLANT, you also pick peace of mind. If you’re looking for “plastic surgeons near me in Pleasanton, CA,” find out if that doctor offers the IDEAL IMPLANT. These implants are filled with a sterile saline solution, which means if they rupture, your body will absorb the saline without any scary side effects. Unlike silicone gel implants, which rupture silently and require an expensive MRI to detect a leak, you can be confident your IDEAL IMPLANTs are intact every day just by looking in the mirror. A recent eight-year study shows exciting statistics for women considering the IDEAL IMPLANT. Eight years after primary breast augmentation, only 2.1% of patients with the IDEAL IMPLANT experienced a rupture in their implants. Silicone gel implants from Allergan, Mentor, and Sientra had much higher rupture rates with 7.2-13.6% of patients experiencing a rupture based on MRI scans. A series of nested shells within the implant reduces the risk of problems such as folding, rippling, or rupture and keeps the saline filler inside from sloshing around. The IDEAL IMPLANT is composed of two separate chambers that hold the saline solution, so if you do experience a leak, you won’t have to rush to schedule a breast implant revision surgery. The dual-chamber design only allows for slight deflation, so you won’t look drastically uneven. You can wait a few weeks and schedule a revision when the time is right for you. Have you ever seen plastic surgery before and after photos that show capsular contracture? This is a common breast implant complication that causes the body to form scar tissue around the implant, which can cause the implant to displace, become firm, and potentially cause pain. In results from the previously mentioned eight-year study, IDEAL IMPLANT rates of capsular contracture after primary augmentation were low at 6.6%, compared to silicone gel implants from Allergan (16.2%, at seven years), Mentor (10.9%, at eight years), and Sientra (11.2%, at eight years). The risk of capsular contracture is significantly lower with the IDEAL IMPLANT. Your Google search of “plastic surgeons near me in Pleasanton, CA,” probably won’t tell you how experienced your doctor is with this complication. Be sure to ask them about it at your initial consultation to make sure you’re in good hands. The IDEAL IMPLANT can give you back your confidence and youthful breast shape to look and feel great. These implants taper to the side to fit the contours of your body, which gives you a more natural look overall. They are more “high-profile” than other implants on the market, which means they appear perkier and will give you more fullness in the upper breast. If you’ve lost a lot of volume after breastfeeding or experienced significant weight loss, the IDEAL IMPLANT can restore your breasts to their former glory. Patients should discuss the right breast implant size, type, and shape with their plastic surgeon at their initial consultation. On Dr. Bachelor’s website, you can browse breast augmentation plastic surgery before and after pictures in the photo gallery to see the dramatic IDEAL IMPLANT difference. Women are thrilled with their results from Dr. Bachelor. Native Californian Dr. Eric Bachelor is a highly experienced board-certified plastic surgeon recognized as one of America’s Top Plastic Surgeons by Consumers’ Research Council of America. After finishing his undergraduate degree at prestigious Stanford University, Dr. Bachelor attended medical school at the University of California at San Francisco. Post-medical school graduation, he completed residencies in General Surgery and Plastic Surgery at Stanford University. Practicing in the California towns of Pleasanton and Danville, Dr. Bachelor offers a full range of services, including non-surgical cosmetic procedures. Dr. Bachelor has performed over 10,000 facial rejuvenation procedures with advanced dermal fillers. Patients who visit Dr. Bachelor’s private practice can take advantage of a host of plastic surgery procedures, and view plastic surgery before and after photos on his website. Dr. Bachelor is also a classically trained, award-winning portrait artist, who brings a special artistic aesthetic to all of the surgical procedures he performs. Patients who want natural-looking results can feel confident in Dr. Bachelor’s surgical skills and artistry. Considering breast implants in Pleasanton, CA? Contact Dr. Bachelor today to discuss your options. Simply call (925) 462-3700, or visit www.ericpbachelormd.com. Dr. Bachelor’s office is located at 1387 Santa Rita Road, Pleasanton, CA 94566. Call today for more information on IDEAL IMPLANT® Structured Breast Implants.